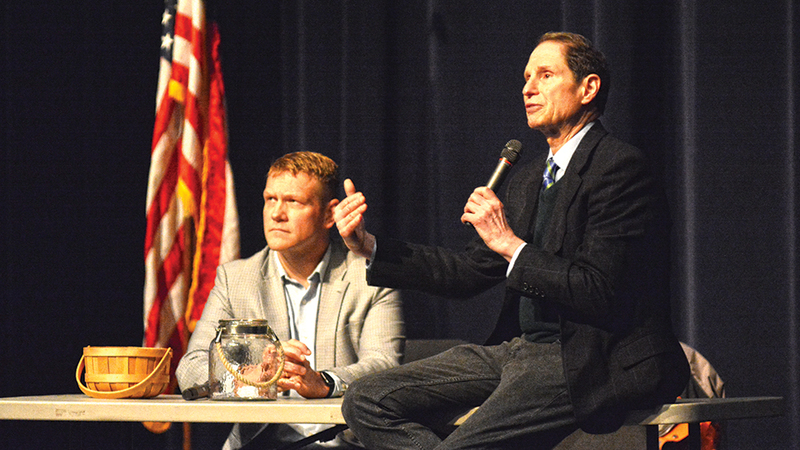 School safety and protecting Dreamers were two of the topics that dominated the conversation as Sen. Ron Wyden (D-Ore.) visited McNary High School for a town hall on Friday, Feb. 23. McNary junior Lauren Murphy, a reporter for the student newspaper, the Piper, asked Wyden about both issues. The senator said school shootings have become normalized. Wyden said he supported an “airtight, loophole-free background check system for every single gun sold in America,” as well as a ban on bump stocks, a repeal of the law that protects gun makers after a shooting and that he would lift restrictions on doing research. Wyden also took the time to respond to President Donald Trump’s tweet about arming teachers. McNary senior Beau Reitz asked Wyden what schools could do for safety besides gun control. Wyden let McNary principal Erik Jespersen address this issue. Jespersen pointed to warning signs and red flags in school shootings found on social media. “We need them (Dreamers) to create jobs in a growing economy,” Wyden added. Wyden also said he “detested” the idea of spending $25 billion on a border wall and would rather spend that money on infrastructure like roads and bridges. A man from the carpenters union asked Wyden about infrastructure. “We can’t have big league quality of life with little league infrastructure,” Wyden responded. “I’m prepared to work with anybody that has a good idea but the country deserves more than Trump tolls,” referring to the President’s plan to lift the federal ban on interstate tolling. McNary senior Jonas Honeyman asked Wyden which issues were not being discussed enough. His response was health care and in particular Medicare, which in its current state will “dominate the budget for years to come,” leaving less money for education, job training and parks. “We are really in this together,” Wyden said. A member from the community asked Wyden to tell the crowd about the importance of voting. Wyden said he hoped by 2020 to take Oregon’s vote by mail system nationally. He was impressed with the questions he received from McNary students. “I’m leaving McNary High School today feeling really good about the future,” Wyden said.